Doug Chrystal, Ivan Kaye and Todd Heslin, are three successful entrepreneurs who have contributed significantly to the ICT industry in Australia. Doug built a business in Melbourne developing compression algorithms for sequel servers - raised $9m of VC in the USA - The business sold for $60m a year later to Quest Software which subsequently sold to Dell in 2013 for $1.2b. Doug left Dell to co-found Referron with Todd and Ivan in June 2012. Ivan is the founder of BSI, a company that is passionate about helping entrepreneurs with a focus on helping innovative companies and entrepreneurs access capital and grants. BSI acquired ADJ (A government sponsored incubator) with $6m in funding, achieved a co-investment of +$200m between 2002 and 2008, and has achieved a number of successful exits over the years. Todd is an ICT entrepreneur who co-founded Apacthco Group, a boutique sustainability advisory practice that helps businesses transition into a low carbon economy. He has recently left this venture to build Referron. Ivan recognised a need within BSI, and the consulting and professional industry in general to track and manage referrals, and developed a prototype with Todd. Todd recognised that referrals are made not sitting at your desk, and identified the need to make and capture referrals on your phone, on the golf course, in the cafe and at the restaurant. Once developed, Ivan showed Referron to Doug, who recognised Referron as a painkiller for corporates, big and small enterprises and associations, and together Doug, Todd and Ivan have set about commercialising Referron. Referron are now in negotiations with a number of major USA and Australian enterprises and associations with a view to assisting them to track, measure and manage referrals with the ability to enable their stakeholders refer to them within 3 taps of their phone. Referron is a game changer and has the potential to go viral quickly. 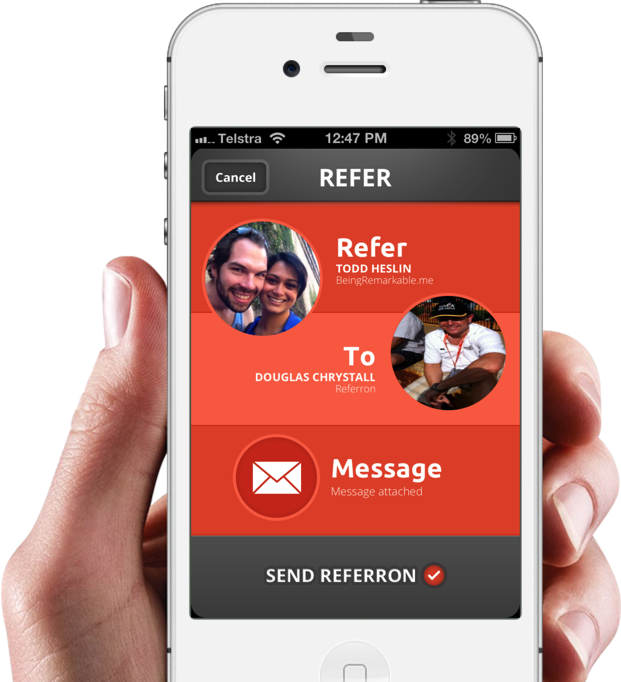 Referron enables you to refer to and get referred by someone you know like and trust within 3 taps of your phone, email signature or your website. -Track and reward your referrals from your own referron portal.